You can also visit the videos page where there is a tutorial demonstrating using the robot in Advanced Cymatic Trader. The robot works on the ladder interface. The goal of the robot is to 'earn a tick', i.e. to back higher and lay lower by one tick. Although the robot has features built in that try to avoid poor market conditions if possible, you will increase your chances of success if you proactively choose the safest markets and choose conservative settings - do not try to force it to trade inappropriate markets. The robot waits until certain conditions are met then it enter orders on both sides of the market passively, joining the the best prices. So initially its two orders will be unmatched and will be at the back of the exchange order book queue, behind the other punters orders which are also at the front prices. The aim is to eventually get to the front of the queue as other punters either pull their orders or get matched. If we get to the front and get matched on both sides then we have made 1 tick profit. The main risk is that other punters enter large orders, or series of orders, that quickly push the price in one direction, thus only matching one of your passive orders and leaving the other order behind with little chance of being matched. The robot attempts to manage this risk by constantly monitoring the queue positions and other aspects that give clues about whether the market is moving sideways. The robot can cancel both orders if it determines adverse conditions. If one order has been matched, the robot then monitors the remaining order and moves its price to take a loss or a scratch (breakeven) if it thinks the probability of making a profit has become too low. Ideally both orders get matched at the original prices and a profit is made. After each pair of orders are concluded (matched or cancelled), the robot then starts the whole process all over again as soon as the conditions are favourable. This is how much other money must be available at the front prices, to trigger the robot to enter new orders. Applies to robot orders, it does NOT apply to orders placed manually on the ladder using the mouse. Simply click the 'start/stop bot' button. When running the robot, please DO NOT manually enter other new orders on the SAME runner, such as on the website or on the exchange view. You should only manually trade runners which are not being controlled by robots. 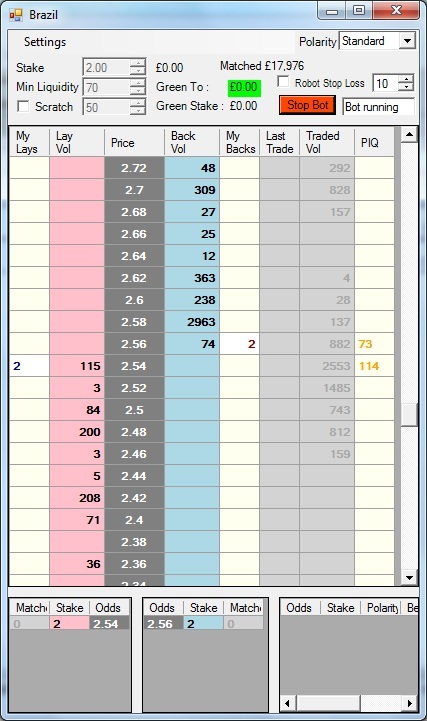 In the screenshot below, you can see that the robot is running and is working two £2 orders (our Stake setting) because there exists enough liquidity at BOTH front prices to meet our £70 Min Liquidity setting. If the volume at the front prices falls below £50 (the value beside Scratch) then both orders will be cancelled. Volume might dry up or prices move away leaving the remaining order stranded. So with these settings the trader is probably hoping that there is enough volatility / noise in the market to fill the remaining order, i.e. expecting the direction to revert back towards the original prices. In the screenshot below, you can see that the robot is running but we are not working any orders yet because it is waiting for £3000 of liquidity at BOTH front prices (our Min Liquidity setting). When all the conditions are met, it will enter £20 bets (our Stake setting) on each side of the market, for example backing at 1.19 and laying at 1.18. 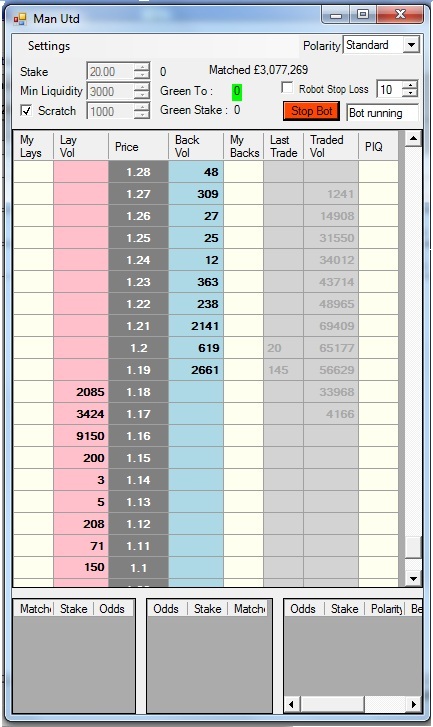 The £1000 setting for Scratch Vol, is used to determine how to manage the orders once they are working in the market. Read more tips on choosing robot settings, which is on the forum (opens in new page). In very volatile markets the robot will have to place and cancel bets very frequently, resulting in large numbers of orders per hour. Do not use the robot on volatile markets because the robot could exceed the number of orders per hour that is permitted by Betfair. Betfair may charge you for doing excessive orders/bets per hour. Please refer to the Betfair Charges on their website. Every effort has been made to build a robot that gives you an advantage over other traders, but there are risks associated with any form of betting or trading. Winning is not guaranteed, losses are possible. Please remember to use conservative settings and only risk a small % of your account on each bet and remember that the robot is not intended for all types of market. Your chances of consistent success are improved if you choose the best markets, so observe the market price action before deciding to start the robot. Don't pick a market that you feel has a tendancy to frequently get swept sideways by a big order or a sudden impulse of trading. You are looking for a stable centre of gravity with a good flow of two way trading. Over time you will learn what settings work best for you and which markets you enjoy. Good luck and happy robotic trading!